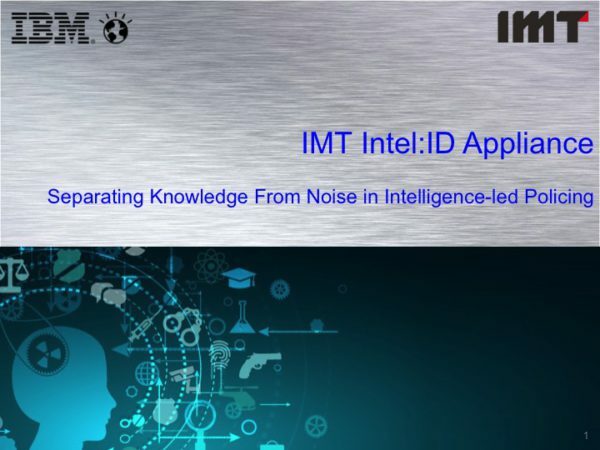 IMT Intel:ID™ helps you gain insights and actionable intelligence by resolving identities, relating them together and alerting you to high-value targets, activities, suspects, events, etc..
Law Enforcement Analysts can spend 80% of their time running queries, collecting data, and formatting reports. With Intel:ID™ we can give them back that time to analyze. IMT Intel:ID™ is a pre-configured Entity Resolution and Name Search appliance that is tuned to meet the needs of integrated Law Enforcement agencies without over-stretching your IT resources. Intel:ID leverages current and historical data from your Records Management System and other data sources to RESOLVE multiple records into a single entity, RELATE records that have non-obvious connections, and ALERT investigators when new activity exists for flagged suspects. Intel:ID simplifies the process to share information between departments and other Integrated Justice agencies while reducing the risk of unintended disclosure. IMT Intel:ID™ is a complete, purpose built, appliance-based entity and non-obvious relationship solution to fit your needs. All you have to do is plug it into your data center and start sending your data; we do the rest. Browse the PowerPoint of our Intel:ID Solution. Law Enforcement Analysts typically spend 80% of the time running queries, collecting and collating data, with the balance of the time formatting and making reports look good. It’s not uncommon for an analyst to say ‘I have no time to analyze.’ The best they can hope to find with traditional search methods are ‘obvious linkages’ (connections they already know). With Intel:ID (based on IBM Identity Insight), analysts improve their capacity to evaluate, analyze and disseminate complete and accurate results, which include ‘non-obvious linkages’ (connections that Intel:ID discovers). Powerful, scalable ETL platform – supports the collection, integration and transformation of large volumes of data, with data structures ranging from simple to complex. Market-leading enterprise service bus (ESB) – offers a fast, simple way for systems and applications to communicate with each other and to optimize the value of existing technology investments. Business Intelligence – offers a web-based and mobile integrated business intelligence suite including aggregate dossiers of persons of interest. Natural Language Processing – custom annotators to reveal hidden insights and patterns across all relevant structured data including incident reports, disclosures, pre-trials, pleadings and evidence, exhibits, rulings, and judgements. 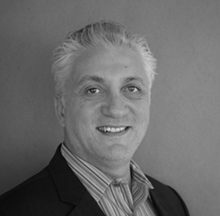 Industry Leading Entity Resolution and Non-Obvious Relationship Determination – resolves inconsistent, ambiguous identity records into comprehensive entities across multiple data sets, despite deliberate attempts at misrepresentation, detects relationships between entities as records from multiple data sources are loaded and processed and supports customizable rule-based reporting to trigger alerts. Duplicate records in the RMS would mean the incomplete information is being used to determine whether evidence meets the charging standard. Could you benefit from Intel:ID? With our Quick Start Assessment, we go to your site, load your client data from separate systems, build a 360-degree view of your clients, and deliver an analytics report. Find more information on our Quick Start Assessment. To understand more about our RISK FREE ASSESSMENT of our Master Data Management or Identity Insight software on your data using our ZERO FOOTPRINT APPROACH click here. IMT offers training that you just can’t get anywhere else. Whether you are totally new to Intel:ID or you’ve been working with Entity Resolution for years, our client training courses will give you the skills you need.